I have been profiling a number of drought tolerant, fast growing screen plants lately and Dodonaea belongs on the list too. These lacy shrubs are also called Hop Bush or Hopseed Bush after their seed pods that resemble hops. Hop Seed bushes come with leaves in either bright, lime green or dark purple. Both versions have leaves about 4 inches long and 1/2 inch wide and are very shiny on multiple shrubby branches. In Los Angeles the hot sellers are purple. I of course, am partial to the green ones. Some Dodonaea are native to Australia, but Dodonaea viscosa is native to the Western US and Hawaii. 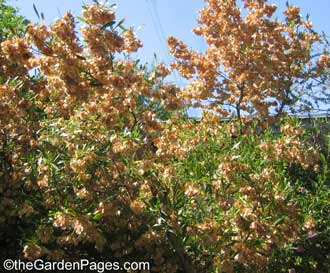 The Zone breakdown for Dodonaea viscosa is: USDA Zone: 9-11, and Sunset Zone: 7-24. These drought tolerant shrubs are fast growers to about 10 feet tall and almost as wide. They take full sun to part shade. Once established in the garden (1-2 years) they can survive on rainfall alone. Hopseed bushes have a growth habit that is a bit airy, with lots of small branches and the long leaves adding to the lacy feel. They can be trimmed as hedges or espaliers for a slightly denser effect or pick one strong branch to train them as a tree. Dodonaea are good for layering in the landscape, to create a full, lush feel in the border. Hopseeds are perfect for the back of the bed (where the sprinkler won't reach), along fences or as border screens. You might try planting a few of these to wall off a secluded garden room in the back yard. In late spring they develop large, papery seed pods, usually light brown, which hang on for weeks and rustle in the breeze. Create a little resting spot near them so you can listen to their rushing whisper and calm down after a long day. Although the seed pods break down quickly in the soil, I do not recommend planting these bushes near pools or any other place where neatness counts. About four years ago I planted three large green Hopseeds and a smaller purple shrub. All four were in one gallon pots. I asked my nursery guy for the biggest one gallons he had but one of them had to be purple (I had to see what the fuss was all about). I wound up with a small purple and three large green plants which probably weren't selling so fast. Fine. I was happy to get the less popular green ones because they were already big. I wanted to screen off a big chunk of the chain link fence out back and fast. The green Dodonaeas were a little rootbound, but off to a good start. After four years the green hopseeds have grown to over eight feet tall and about six feet wide. They can get up to 15 feet high and as wide. My purple Hopseed is still thin; only about six feet tall and has only spread to about four feet. The plants are growing near each other, get the same amount of water (not much) but a bit less sunlight. Perhaps that is why the purple Dodonaea is lagging in the growth department. My Sunset Western Garden Book tells me that the purple and bronze cultivars also need more sun to keep their color. The purple Hopseed sort of recedes into the back of the bed, creating a dark shadowy shape. It would be a great effect if you want to create some mystery in your garden: what's back there? is a secret chamber hidden behind those leaves? The green Hop Shrubs in contrast, are very lacy, willowy and stand out. They have grown through the shrubs next to them and I like the wild effect of having bright green sprigs waving in the breeze. Nether color Hopseed creates a solid screen the way a brush cherry can. You can sort of see through them if you try. But they're pretty , drought tolerant and fast growing. Think of them as green lace curtains for your garden. Here are a few photos for you to enjoy. Happy gardening!